While many Indigenous people(s) are happy to teach and educate, many are, frankly, tired of it. Becoming a respectful ally to Indigenous peoples requires work and learning, and we agree that one best practice is for allies to take primary responsibility for that learning by doing their own research. Indigenous experience and history can be very different between one person and another, and from one territory to another, but in general it’s good to have a basic understanding of whose territory you are living on, what their language is, and the history of Indigenous-settler relations in your area, including residential schools. After getting started on your own research, conversations with Indigenous peoples have the potential to be real, thought-provoking, honest and reciprocal conversations, because the basics were covered on your own time. The idea for this blog grew from a webinar we hosted for an audience of non-Indigenous environmentalists who wanted to talk about what it means to be a good ally to Indigenous peoples. Neither of us felt like experts on this topic, and we talked a lot about what we could offer the group that would be honest, humble, and useful. This blog post arises from those conversations and is offered in the spirit of sincere engagement with a process that is complex and difficult, but ultimately transformative. We are still learning ourselves. We offer some thoughts on what we believe to be building blocks for allyship, shaped by our personal experiences. To us, out of all the building blocks above, listening is the foundational one. Listening means more than just hearing. It means active listening, or listening with your whole self. There is a word in Anishinaabemowin – nah – which means “pay attention with your whole soul/being.” That is the kind of listening that is needed. But before asking an Indigenous person to educate you on how to be an ally, do some of your own reading and listening first. Luckily we live in the digital era, so you can choose your platform(s) to conduct your research – Indigenous language apps, news stories, essays, fiction, blogs, podcasts, music, and online courses are all available ways to start learning and engaging (you’ll find links to some resources at the end of this post). For example, to prepare for the webinar, we asked the participants to identify the territory they were on and to say a word in the language of the Indigenous people(s) of that territory. The internet can be a starting place to gain basic information that can help begin the process of respectfully identifying whose lands you are living on and benefitting from, while recognizing that there may be shared territory between Indigenous nations. What does being a respectful ally mean? Rayanna: To me, allyship involves recognition and connection to Indigenous lands and people. 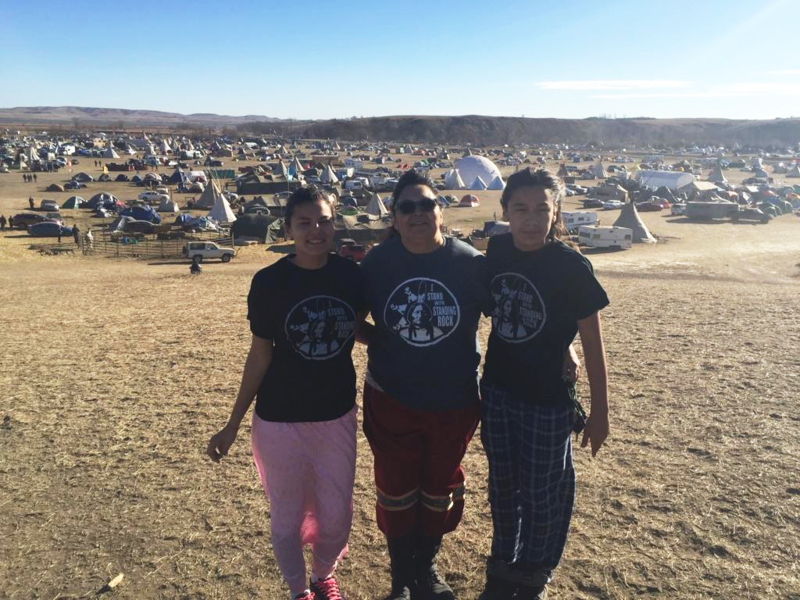 I visited the Standing Rock Sioux Tribe in 2016 with my mom and little brother to show support and bear witness to their Oceti Sakowin Camp to protect their water from oil (see #MniWiconi). It was here that I realized what allyship meant, as an Anishinaabe person visiting Dakota and Lakota territory. As visitors, we were given a “crash-course” of the Camp and their prayerful movement. A grandmother was our teacher, and my greatest take-away from her was that I came to support and stand in solidarity with the Lakota and Dakota in their movement to protect the water and all living beings who hold relationship and survive off of it. From this, I make it a point to recognize whose territories I am on when I travel, and the notion of ‘Standing in Solidarity’ guides me in the work I do with Indigenous peoples in supporting the revitalization of their Indigenous laws. However, this is probably easier for me than it is for my non-Indigenous peers. In order for non-Indigenous peoples to stand in solidarity, listening and observing is key. Sometimes this requires stepping back. One example from my own experience (out of many I am afraid) involves a gathering where our Elders asked for volunteers to conduct a ceremony. The first to put their hands up were non-Indigenous visitors. I understood that they wanted to help, that their intentions were good, but was it necessary to be the centre of our ceremonies? Perhaps if the eager non-Indigenous visitors had waited 30 seconds (or observed), an Indigenous youth standing at the back who was shy and debating putting up their hand would have done so. Then they would have had the opportunity to be in their rightful place, at the centre of our ceremony. Or maybe no Indigenous youth put their hand up, but at least they were given space and time to decide. What this example teaches is that it is not the responsibility of an ally to be at the centre of our spaces, it is an ally’s responsibility to stand in solidarity – whether that is beside Indigenous peoples or behind Indigenous peoples. The front and centre is for our people. Erica: To me, as a white settler, allyship with Indigenous peoples is about commitment, listening, and change. Allyship means a commitment to be in the struggle for the long haul, to be there for the peoples you’re standing beside. It means that you believe in their goals and will support their work to achieve those goals. It’s a commitment to life-long learning (about how to be a respectful and informed ally), and unlearning (of stereotypes, disrespectful beliefs, and more). And it means that you must commit to co-creating honest, healthy, and caring relationships with the Indigenous people(s) you are allied with. My introduction to allyship with Indigenous peoples happened when I had just graduated high school, and it was all about listening. I was wandering around downtown Vancouver when I heard drumming and singing, and went to check it out. I found myself in the middle of a march led by the plaintiffs of Blackwater v. Plint (content warning: sexual abuse), which was one of the early cases establishing government and church liability for the sexual abuses perpetrated in residential schools. I walked with the crowd until we reached Robson Square, where the participants in the case spoke about the experiences that had led them to file the suit, and what they hoped the lawsuit would mean for their children and their children’s children. I had never learned any of this in my own schooling. Learning about it broke my heart. I sat there for hours, listening. Fifteen years later I am still listening and trying to learn the things that ought to have been taught to me in school, but mostly weren’t. This hole in our education is why non-Indigenous people have a special responsibility to learn the hard truths about our country without asking Indigenous people(s) to recall experiences of trauma in order to teach us. As well as listening, I have learned that allyship with Indigenous peoples requires humility, empathy, and a willingness to change and grow in ways that aren’t always comfortable. Being a good ally to Indigenous peoples means that we as settlers need to learn how to recognize the ongoing colonial legacy at work in Canada – the racism, environmental and social inequality, and dynamics of power and privilege that influence relationships between Indigenous and non-Indigenous people(s). When we recognize these things, we need to confront them, especially when they’re operating within ourselves, our organizations, or our movements. It also means being ok with having your words, assumptions, and actions corrected. Finally, and most fundamentally, I believe that allyship means recognizing and upholding Indigenous self-determination and decision-making authority. The front and centre of this movement is for Indigenous peoples. Becoming an ally requires research, stepping out of comfort zones in order to move forward, and committing yourself to this process, which takes time. The show “First Contact” proves that the journey of gathering these building blocks to become an ally requires work, and that listening is easier for some than it is for others. This show also exemplifies the fact that most Canadians do not have access to a 28-day journey to travel to Indigenous communities to hear their stories. However, most Canadians do have access to the internet. Although many Indigenous people(s) are willing to share their experiences and continue teaching, the burden of enabling learning does not ultimately rest on Indigenous peoples’ trauma. As a final note for settlers, the learning journey to becoming a respectful ally is not about being the hero or the “saviour,” rather it’s about standing in solidarity. Canadian Centre for Diversity and Inclusion, 2017. "Creating Safe Spaces for Communication"
Chaitin, Julia. From Beyond Intractability. Eds. Guy Burgess and Heidi Burgess. Hon. Chief Justice Lance Finch, 2012. Unsettling Canada: A National Wake Up Call. Manuel, Arthur and Grand Chief Ronald Derrickson, 2015. The Reconciliation Manifesto: Recovering the Land and Rebuilding the Economy. Manuel, Arthur and Grand Chief Ronald Derrickson, 2018. - Allyship with communities of colour in the era of Trump. Written for the US context. Truth and Reconciliation Commission of Canada, Final Report and other resources. Whyte, Kyle Powis, 2018. In Yes Magazine.